CEMETERY SUNDAY 2012: A great number of family members of Redemptorist Brothers and Priests, buried in our community Cemetery here , travelled to Esker for our annual Cemetery Sunday. The weather was not kind to us, the Mass was celebrated in the Church, and the prayers said, as it was raining too heavily at the time. It was great to welcome so many who came, some from long distances, to honour their deceased relatives, many long since dead. In a lovely new book on the Irish Redemptorists (The Redemptorists in Ireland 1851-2011, by Brendan McConvery, C.Ss.R.) 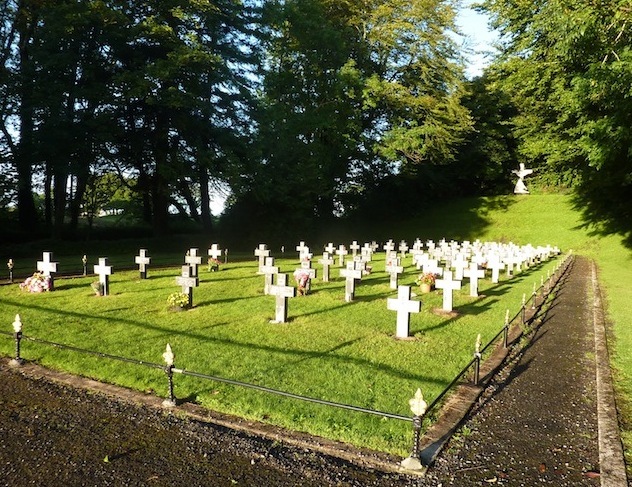 we read that among the first community of Redemptorists in Esker in 1901 were two men, Father Patrick Sampson and Brother Casimir O’Gorman, and they are buried in our cemetery. So our Cemetery Sunday celebration connects us with the very beginnings of the Redemptorists in Esker! I looked for Br. 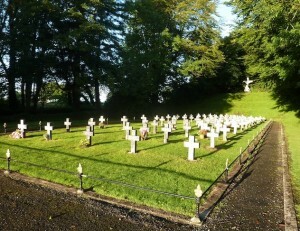 Stanislaus McVeigh’s grave over in our cemetery. It isn’t there. I wondered where was he buried? And I emailed Fr. McConvery and he referred me to the chronicles of Esker. There, in the first book of the chronicles of Esker, I found the description of Br. McVeigh’s death. It also described how, given that they had not yet developed a cemetery in Esker, his body was escorted to Athenry train station. The community, all wearing their habits, walked beside his coffin, and then sent his remains in a train car specially set aside, for burial in the crypt of Mount Saint Alphonsus, Limerick City. So in Brother Stanislaus McVeigh we are connected to the roots of Esker even before the days of a cemetery here! As many of us walk around the cemetery, and read the names of friends, family, and characters we will find some we liked or loved, and maybe some whom we found to be heavy going!! We are clear, I hope, that none of us are perfect, nor were any of the men buried in our cemetery. But they were good enough for God to work with and through! And so are all of us, good enough for God to work with and through. And usually in ordinary ways. So, today, we honour and connect with all those who have gone before us. They invite us, from their colourful or their black and white lives, from their great and small achievements, and even from their mistakes and sins…they call us to let God’s Spirit flow through us, to live fully, to not fear making mistakes, and to not postpone living, loving, connecting, and caring. ← Reflection: 23rd Sunday in Ordinary Time, Year B: September 9, 2012.